Unique Wall Effects in Endless Colors and Fantastic Patterns! The Largest Selection Available at Factory Direct Pricing! 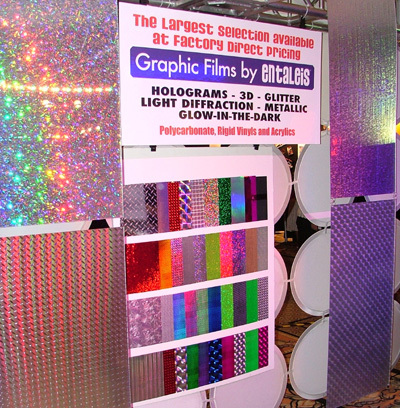 AMAZING custom environments are achieved with digitally produced holographic film patterns that change the way you look at light and color. entaLeis™ provides sales and consultation on this incredible NEW film as a design element for any production or installation. 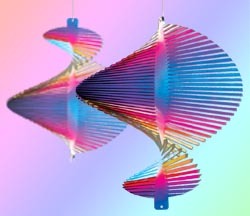 Our approach is to provide you with an inexpensive alternative for creating a beautifully stunning display of light and color. Use anywhere when your objective is to be DIFFERENT while conveying an image of power, energy, innovation and excitement. 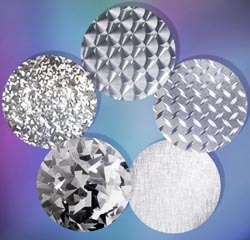 The Sterling Collection of ACRYLITE® acrylic sheet offers five smooth, decorative, silvery patterns with the look of metal. From contemporary to industrial, each design emits a spectacular reflective effect. The collection offers a lightweight, fabrication-friendly option to metal with the durability and impact resistance of acrylic. It is more economical to fabricate and ship than metal and is a safer option for displays in high traffic areas. 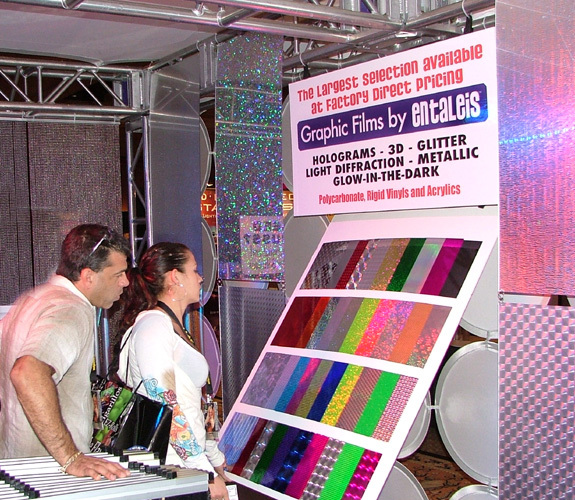 .118" (3 mm) 48" X 96"
ACRYLITE® Radiant acrylic sheet creates dazzling color changes and dramatic eye-catching movement, all without specialty lighting! Radiant sheet magically shimmers with iridescent colors that change as the viewer moves. Using ambient light to create its own lighting effects, Radiant sheet energizes liquor displays, signs, and club interior atmospheres. It can be cut, routed, drilled, line bent and polished. Contact Us For Samples and Consultation.